Southern California lacrosse fans saw the Maryland Terrapins first-hand in last year’s Pacific Coast Shootout against North Carolina. With the Terps coming back to Orange County to face Notre Dame in the 2016 PCS on March 5, here are a few things to know about the Maryland program and this season’s squad. Tickets for the PCS are available now, including group discounts. Check out the event website for details. 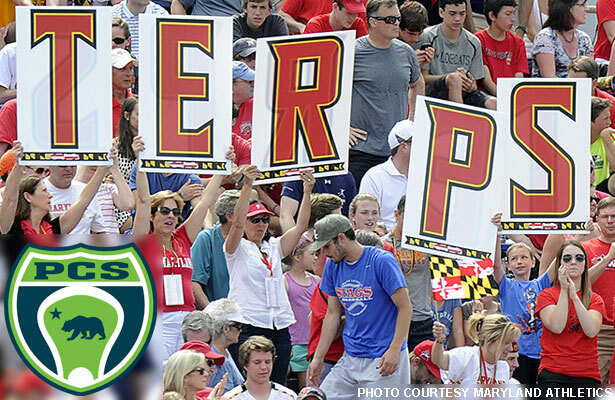 Lofty expectations: Inside Lacrosse ranked Maryland No. 4 in the nation in its preseason Top 20, citing the return of goalie Kyle Bernlohr and a handful of offensive stars. Talented Terps: Six members of the Maryland men’s lacrosse team have been named 2016 Preseason All-Americans by Inside Lacrosse, led by a first-team nod to goalkeeper Kyle Bernlohr. Defender Matt Dunn and short-stick midfielder Isaiah Davis-Allen were named to the second team; senior Bryan Cole and junior Matt Rambo made the third team; and midfielder Pat Young was an honorable mention selection. The six selections were tied for a NCAA-high with Notre Dame and Virginia. Credit to the coach: Coach John Tillman has led the Terps to four NCAA Final Fours in five seasons, posting a 63-23 (.733) overall record at Maryland — the most wins ever by a Maryland coach through his first five seasons. The Maryland defense has ranked in the nation’s top 10 in scoring defense all five seasons of his tenure, including a national-best 7.1 goals-allowed per game last season. Streaking Irish: The Terps were 5-1 all-time against PCS opponent Notre Dame through the 2014 regular season, but Notre Dame has won the last two meetings between the schools, both in the 2014 postseason. After the Terps won 12-8 in South Bend, Ind., to claim the 2014 ACC regular-season title, the Irish posted a 6-5 victory in the ACC Tournament semifinals and an 11-6 win in the NCAA Tournament semifinals. Maryland did not face Notre Dame last season, having moved from the ACC to the Big Ten. Win forever: Maryland is the only major program in Division I NCAA lacrosse to never have a losing season — a span of 90 years. Cornell is currently second overall with 17 straight seasons at .500 or better. Maryland has won at least 10 games and advanced to the NCAA Tournament in 13 consecutive seasons — both are the current longest streaks in the NCAA.